We are just back from a very relaxing week at Inishbofin Island in Co. Galway. Ireland is of course already an Island, but as it happens, there are quite a few smaller islands off the larger Island of Ireland, Inishbofin being one of them! Our journey started off missing(!) the 2 O’Clock ferry at Cleggan ( check out the Ferry schedule here), as traffic was quite heavy heading to Cleggan via Clifden, so always allow plenty of time. The distance from Galway to Cleggan is only about 65 miles, but the roads are narrow, and you might meet the odd sheep on your way, so take your time! As you can’t take your car to the Island, you’ll need to leave it at Cleggan. You could try to find a space at the very crowded pier, but you are probably better off( ie safer for your car) to park it at a few of the impromptu cark parks in a field…charges vary, but allow 2 – 3 Euros a day . When you are buying a ticket and you are bring your own bike, there is 5 Euro charge to bring your bike, so don’t forget to mention it, as otherwise you’ll hold up the flow of people getting on the Ferry! Your trip will take you through one of Ireland’s most beautiful area named Connemara, and if you have never seen Connemara, you’ll probably want to pull over your car several times to take some pictures! The Island has a very informative website which gives you a good idea of places to stay, things to do, music, festivals etc. 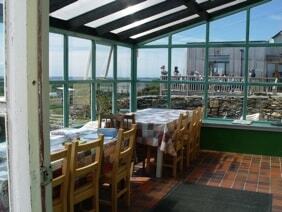 We had been to Inishbofin before, and rented a self catering cottage at the East End. It’s right at the beach, so if the weather is nice , the beach is just literally at your doorstep! This year however, we had left it too late to book a cottage, but discovered that the local hostel offers family rooms. 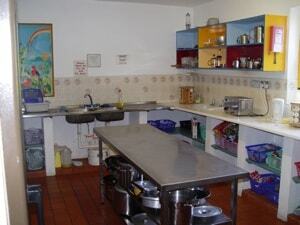 We were traveling with friends of ours, so we each had our private rooms. Ours had a bunkbed for the kids, and a double bed for us. We also had a sink, and shared the bathroom with another family. Our friends had 3 bunkbeds. 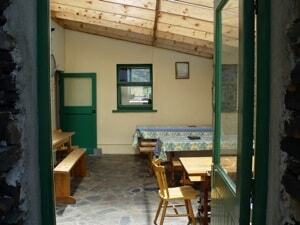 There are also camping facilities. 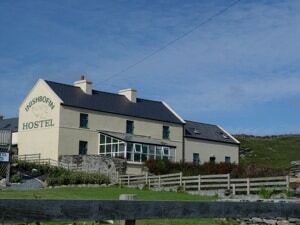 Here is a link to their website http://www.inishbofin-hostel.ie/ and a picture of the Hostel at Inishbofin. So we caught the 18.45 ferry instead, leaving us off at the Pier at Inish Bofin about 45 minutes later. Kiaran – the owner of the hostel- was awaiting us with his van at he pier to bring our luggage to the hostel, so we cycled ( or at least the flat part – the road is pretty steep). It’s a good 15 minute walk from the Pier to the Hostel. We brought most of our own provisions, as the Island has only one (food)shop and only operates from 11 AM till 5PM, so if you realize later in the day you have ran out of milk, you’ll have to wait till the next day ( way past breakfast!) to get your provisions. New provisions arrive every day by Ferry, but you’ll see that things like bananas will be gone once they arrive in the shop! We missed out on the market on Monday at the community centre, as that would have allowed us to buy some locally grown vegetables. Another important detail, the Island does not have an ATM(cash) machine, so it is recommended you bring cash for your stay. Staying in the Hostel really was the highlight of our stay… there was a Danish couple who have been coming to Bofin for many years. I got talking to Anne, and she told me came to Inish Bofin about 35 years ago, and at the time, the Island didn’t have electricity. Electricity and running water only arrived in 2002! There was a a great mix of Dutch, Canadian, French, German guests and a mix of Irish families all happily hanging out in the hostel. Don’t think the kettle ever stopped being boiled! As we have two small kids( and no television in the hostel) they spent many hours in the playroom, playing cards and games with other kids and guests. For our part, if we weren’t going for a stroll around the Island on our bikes or by foot, we spent many hours drinking cups of tea/coffee, talking to the other guests or just reading a book. There is a veranda on the front which has a beautiful view, or the back area if you wanted more privacy. Inishbofin is also known for its music, so there is usually live music( session) in the bars. This year they are also having concerts , we went to see Don Stiffe in the hotel next to the hostel. If we had gone a week later( ie next week) we could have listened to Damien Dempsey!